Before enrolling at the University of Delaware, Rachel Acciacca knew that she wanted to accomplish two things in her professional life — serve the nation in the military and become a veterinarian. Once she heard about the Army Veterinary Corps, she knew her path was set. Acciacca, a Veterinary Corps officer in the U.S. Army, was a UD Honors Program student who studied animal science as a pre-veterinary major in the College of Agriculture and Natural Resources (CANR). She also minored in biology and completed four years in Army ROTC. At CANR, Capt. Acciacca served as an Ag Ambassador, was a member of Sigma Alpha and assisted with Ag Day. She was also a member of the women’s ice hockey club team and rode and trained horses and competed in eventing, an equestrian sport that involves dressage, cross-country and show jumping. 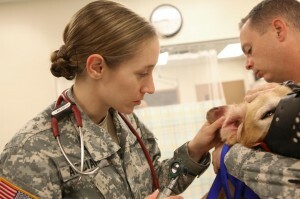 After being commissioned as a second lieutenant out of ROTC and receiving an educational delay to postpone her active duty service obligation until after veterinary school, Acciacca earned her doctor of veterinary medicine degree from North Carolina State University in 2011. Following graduation, she was assigned to the Department of Defense Military Working Dog Hospital in San Antonio, Texas, and after completing her internship she was assigned to her current position as branch chief of Veterinary Services at Marine Corps Base Camp Lejeune in Jacksonville, N.C. As a military veterinarian, she provides around the clock emergency, medical, and surgical support to the military working dogs (MWDs) throughout coastal North Carolina. “I am responsible for ensuring that these MWDs are medically fit for short-notice deployment, and managing their routine preventive care,” said Acciacca. “I am also responsible for managing our veterinary treatment facility, which provides routine veterinary care for service members’ privately owned animals.” Acciacca said that she also provides veterinary support to the base horse stables and works closely with the installation’s public health and preventive medicine teams on issues such as “disease control, rabies prevention and control, animal control, and epidemiological studies.” Being an Army veterinarian is not simply limited to taking care of animals, as Acciacca explained there are many facets to the job. “Military veterinarians need to be prepared to manage and respond to an extremely wide variety of mission requirements, environments and unpredictable situations,” she said. “You may get tasked with developing an agricultural support mission in a developing country, respond to a food-borne disease outbreak in your area of operations, develop casualty evacuation procedures, or respond to a foreign animal disease risk.” In her role as branch chief at Camp Lejeune, her overall mission is to lead and supervise military and civilian staff. “I oversee our unit’s training and mission readiness to ensure that all soldiers are competent in the basic soldier skills and their job-specific tasks. Our veterinary services mission here at Camp Lejeune has two main categories — veterinary medical services and public health and veterinary food inspection and quality assurance for the surrounding installations.” Their food inspection and quality assurance mission involves inspecting all sustenance that is delivered and sold on base to ensure that it is wholesome and safe for the consumers. While Acciacca has no set day-to-day routine, as each day presents its own unique challenges, she does try to dedicate one day a week to privately owned animal surgeries, two days a week to military working dog medicine and surgery, and a day to handle managerial and branch leadership issues. The soldiers of Camp Lejeune veterinary services also dedicate one day a week to training to ensure they stay up-to-date on general military skills such as marksmanship, land navigation, leadership skills, and resiliency training. Experience at UD Acciacca said she enjoyed her time at UD, and said that CANR helped set her on the road to success. “The close-knit community at CANR was very supportive and encouraging,” she said. “I still remember individual professors who went out of their way to support me and prepare me for veterinary school. Everyone there was always so approachable, and I truly felt that they were dedicated to seeing me succeed.” For any UD students currently interested in applying to veterinary school after graduation, Acciacca said, “Don’t ever doubt your ability to become a veterinarian — if you want it badly enough, you will make it happen. Work hard, seek out many different types of animal or veterinary-related experience you can, and keep your mind open. It’s a lot of work, but it’s a blast and I wouldn’t trade my job for anything.” Article by Adam Thomas This article can also be viewed on UDaily.